Two have gone onto a raised mound, and the third at ground level but with a dose of gypsum in case there is clay below the root ball. Mounds need only be 120 mm above ground level to achieve the drainage required. This is the hardiest of the kangaroo paws and is used in breeding the new hybrids that are in many nurseries these days. I must say that I like the species plants even though I admire the new colours. 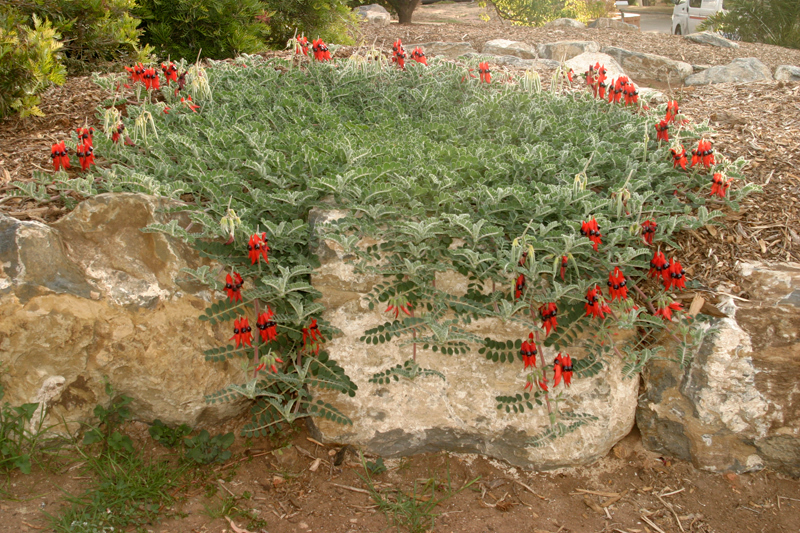 The strappy leaves on this plant can grow up to a metre tall and the clump to a metre across. However the flower spikes can grow to two metres . The seed I was given came from plants that had these very tall spikes and many flowers on the stalk. It grows best in moist, light to medium soils, in partial to full sun, but will tolerate dappled shade. It can be damaged by frost. Black ink disease is a problem in misty areas or locations where there is not enough air movement. Slugs and snails will cause a lot of damage. A request for help with a site that was clay soil in full sun in summer and full shade in winter prompted a look through my reference books. I was able to find the following list of plants. Do what you can to improve the drainage of the clay. Liberal sprinkling with gypsum, at least a Kg per sq metre is required. The rain will wash it in or you can water it in. Here are some shade loving plants that tolerate full sun, and vice versa! Most of these will require some water in Summer once established, to keep them at their best. A mulch in summer will assist with evening out the soil temperature. Dianella revoluta and Dianella tasmanica are good ones. In an earlier post on growing Xanthorrhoea, a comment was made about using milk cartons as a cheap deep pot that will accommodate the root systems of Australian native plants. As a result of that comment, ‘Roughbarked’ sent some very useful ideas on how to actually use the milk cartons as planters and as tree guards. I have been saving milk cartons for a while as I am about to replace a couple of hundred plants, and we have a family of hares and some rabbits. (If I had my way they would all be in the stew pot!) The destructive pests wil eat plants off below the last set of leaves leaving no opportunity for re-shooting, and resulting in the loss of the plants. Commercial tree guards are available, but of course the extra funds spent on these could go on buying plants. This is the very useful comment made by ‘Roughbarked’. Milk cartons as pots and tree guards. I use a knife and stab the cartoon on each of the four faces once, in or near each corner. If you use a knife long enough you can stab right through two sides at once, flip the carton stab it again the same way and the job is done. I also cut the folded top part off so that all cartons have a neat and equal size. The stabbing leaves only slits so the water can drain but not drain too rapidly. Yes, the bottom of the carton will deteriorate and I have often just slipped the old carton off and slid the lot into a new one. The benefits of milk cartons as a pot for natives are the long straight sides and the corners. The roots will hit the corners and follow the water down to the slits I cut. This creates a healthy root system that cannot become pot bound. When planting out from milk cartons, I will point out that it is the only useable pot for natives, that does not have to be upended. I just tear or cut the bottom off, grasp the carton by the top and drop it downwards. The plant roots and mix all stay together and slide out into the hole you have dug. The milk carton slides upwards. Stop it just before it slides all the way off. Water and backfill the hole leaving the milk carton as a tree guard. Done with skill, this does not require stakes to hold the carton erect. The carton will remain for up to two years as a tree guard that is biodegradable and will not cause the trees stress by becoming a tourniquet, as some plastic tree guards do. An email came today asking for assistance with species that would grow in bore water with high salt readings. This is a difficulty for many in the mallee areas of South Australia and no doubt other parts of the country too. 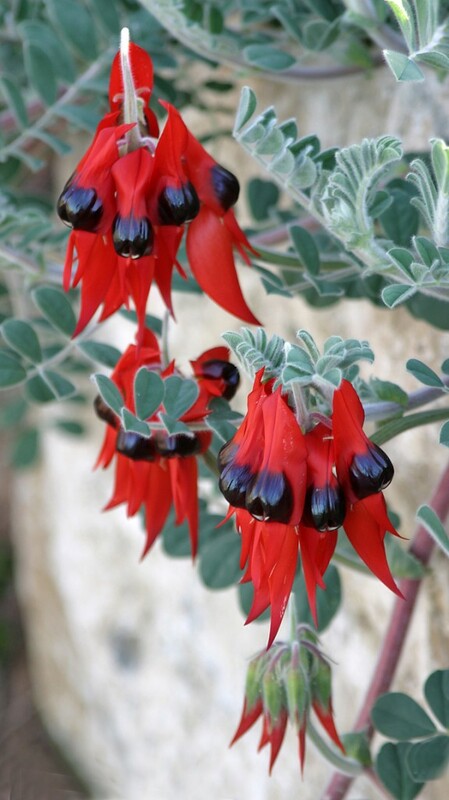 In many cases it becomes trial and error to see what would grow in such a situation, but some lists have been compiled by members of the Australian Plants Society which give a good starting point. There are some things to consider. There is a need to ensure that watering is deep. Choose plants from areas which have the same rainfall situation ie same amount of rain, at the same time of year. This is to ensure that plants will get minimum exposure to the high salinity. If possible place highly desirable plants near an alternative water source, eg rain water, to get them well established without the saline water. 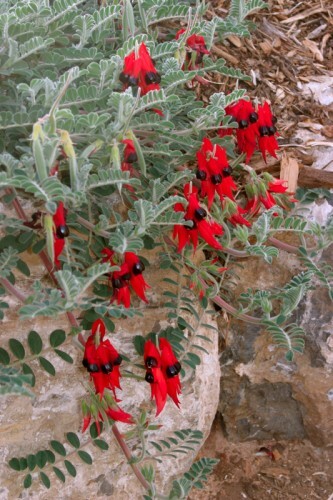 List of Australian Native Plants with salt tolerance. More lists will be available soon. 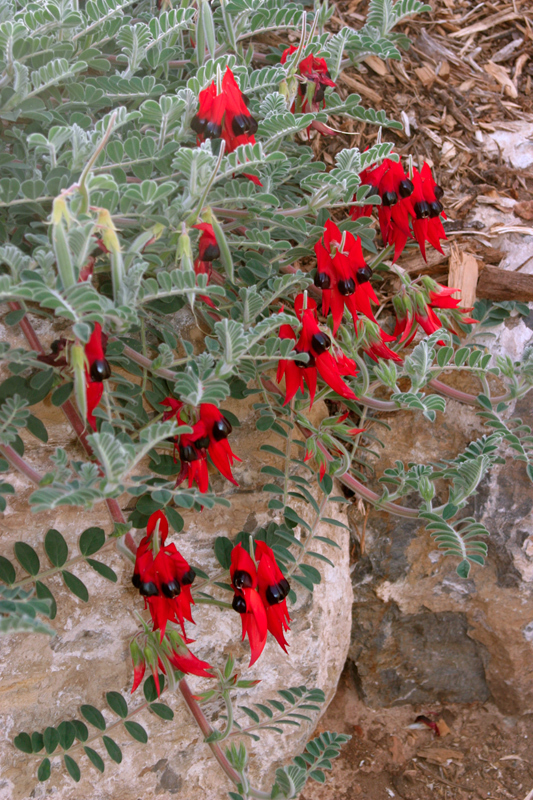 I was sent some lovely photos of Sturt’s Desert Pea by a reader of this blog. As you can see, the plant is dense and lush, as you would want to have it in the garden, not in a state of survival. Sturt Peas need to be watered. They respond with excellent growth and numerous flowers. Water well pots are very good. The only exception to this might be if you had a self sown plant. These are remarkably hardy as self sown plants seem to send the roots very deep. They also respond to being fed. 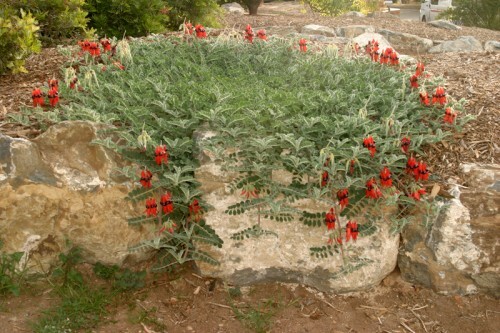 Use a fertiliser designed for native plants. In the photos the plant is growing in a raised bed. It has been shown that so long as the planting mound is at least 10cm(4 inches) above the surrounding soil, that will give the required good drainage.